This year I had the opportunity and privilege to work with one of the leading London design agencies which specialises in transportation design. My mission was to develop an innovative interior design concept for one of the world’ best train and airline companies. Unlike automotive design transportation has different design criteria such as designing for public use, the length of product life-cycle, the cost sensitive production processes and different type of tolerances in engineering. Which means that form language has to stay relevantly robust and simple and design has to be durable in order to be operational for many years to come. I have made this quick case study of airline business class seats to showcase my ideas applicable in the transportation design sector. The idea of the concept is to deliver total privacy and great comfort for passenger with the best possible cinematic experience – a 40 inch OLED screen. The concept is divided in half: the top part is dedicated to technical functions such as OLED screen, foldable table, headset cabinet and HMI controls. Next to that form gives complete privacy to traveler. The lower part is dedicated to legroom, magazine pocket and luggage room. These are hard parts that form sort of armour around the soft leather wrapped seat which is designed in high contrast. 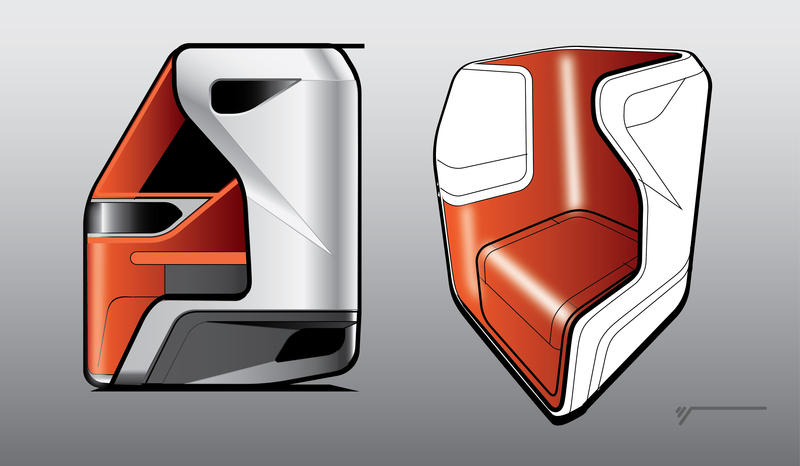 Layout plays a key role in designing a seat for an airline. Designers battle every inch in order to find some space for innovation that facilitates comfort and premium experiences. A lot of airlines use tilted layout to add comfort in width but also in order to save space in length. In this particular case study I chose a slightly different approach designing straightforward facing business class seats. The idea is to provide more comfort thanks to the seat’s increased length so premium passengers benefit from more legroom which is crucial especially on the long-haul flights.Meanwhile seat has to stay relatively narrow 24 inches with 80 inch in length and has LOUNGE,SLEEP,SIT modes. While searching for volume and proportions the DUAL theme comes out strong with wrapping shape around seat delivering total privacy to traveler. I drifted towards more rational approach with timeless appeal. This allows more freedom to pack the space efficiently with great aesthetics. While designing challenging products one has to make plenty of LOOPS (engineering and design feedback implementation rounds). Here we see only first loop which in reality would be follows by many more.